Batted Ball Caroms off Wall Into Stands - HR or 2B? On Saturday, Jose Altuve's batted fly ball exited Houston's playing field unusually as it hit the top of the padding on a lower portion of the outfield fence, bouncing over the right-center field wall and into the stands: Is this a A) home run, B) double, or C) Let's just have Replay Review sort it out? 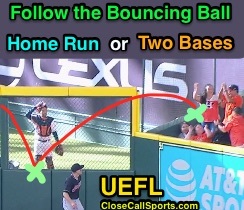 Bouncing batted ball in Houston: HR or 2B? The Play: With one out and none on in the bottom of the 8th of Saturday's Indians-Astros game, Altuve hit a 0-1 slider from Indians pitcher Neil Ramirez on a fly ball to right field, where it struck the lower padded portion of the outfield fence and caromed directly into the stands, without ever touching the ground nor any player. The Call: After 2B Umpire Jeremie Rehak's initial home run ruling and consultation with Crew Chief Bill Miller (working third base) and crewmates Todd Tichenor (HP) and Alan Porter (1B), Miller declared the play a home run, drawing a brief dissent from Indians Manager Terry Francona, and an immediate election to initiate a Crew Chief Review. Bill Miller announces the result of a Replay. 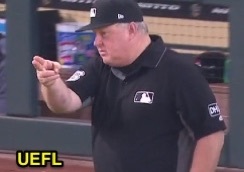 Replay Review: After a brief review, the Replay Official deemed the play a two-base award, determining that the ball hitting the wall's midsection constituted a bounding ball. By rule, any bounding ball that exits the playing field is a two-base award. The answer to the above question is C B. 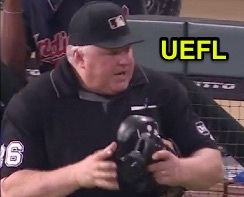 Precedent: What's unusual about Saturday's play in Houston is that a very similar play transpired just three years ago and the umpires acted nearly identically as they did Saturday. In 2015, Gerry Davis' crew similarly encountered a batted ball that deflected off the middle of an outfield wall in Kansas City and subsequently bounced over an adjacent portion of the wall. Like Miller's crew, Davis' crew originally ruled the play a home run, a decision subsequently overturned via Replay Review to a two-base award. See Official Baseball Rule 5.05(a)(7) ("A fair ball, after touching the ground, bounds into the stands, or passes through, over or under a fence, or through or under a scoreboard, or through or under shrubbery, or vines on the fence, in which case the batter and the runners shall be entitled to advance two bases"), which establishes that a bounding ball that exits the playing field results in a two-base award. This is obviously not a traditional ball-hits-ground situation, is not covered by the Minute Maid Park nor Universal Ground Rules, and is not covered by the MLB Umpire Manual's interpretation that a ball which strikes the top of the wall and exits the playing field is a home run. The top of the wall is in play until it isn't. However, Wendelstedt shares a NFHS interpretation of this particular play (8.3.3) that finds that the ball must clear the fence in flight or on deflection from a fielder in order to be considered a home run, which, in OBR, is Rule 5.05(a)(5) ("A fair ball passes over a fence or into the stands at a distance from home base of 250 feet or more") and Rule 5.05(a)(9) ("if deflected [by a fielder] into the stands or over the fence in fair territory, the batter shall be entitled to a home run"); the middle of the fence is not "in flight" enough. See: Jose Canseco for more. SIDEBAR: A batted ball in flight deflected by a fielder into the stands in foul territory (to the foul side of the pole) is a two-base award. The reason that a ball that hits the top of the wall and immediately bounces out of play is considered a home run even though the ball is not physically "in flight" once it touches the top of the wall is because MLBUM specifically interprets the issue of a ball striking the top of the wall and no further permutation or possibility. This same interpretation holds that the top of the wall is considered both in play (insofar as a ball that strikes the top of the wall and caroms back into the playing field is in play) and out of play (insofar that a ball that comes to rest on the top of the wall is considered dead). For more on the top-of-the-wall interpretation, see this incorrect Replay Review decision from 2017. Spirit of the Rule: An interesting note about related Ground Rules history pertains to a recent change to the Dodger Stadium ground rules, which suggests the spirit in which the home run rule exists. In the past, Dodger Stadium featured a ground rule that held that if a batted ball in flight hit any part of a bullpen gate in the outfield and bounced into the stands, the ruling would be a home run. Illustration of Dodger Stadium's ground rule. Upon review, this ground rule was found to be in conflict with the Official Baseball Rules, which, according to Rule 4.05, is illegal ("ground rules...shall not conflict with the official playing rules"). 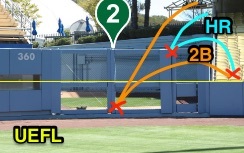 As a result, the ground rule was changed to "Batted ball hitting bullpen gate in either left or right field at a point above the lower wall and continuing over the lower wall in fair territory: Home Run." The purpose of this change was to bring the ground rule into compliance with the prevailing interpretation that a ball must achieve the wall's height in order to be eligible to be considered a home run pursuant to Rule 5.05(a)(5) [there is no minimum height issue for a batted ball deflected by a fielder, as in 5.05(a)(9)]. This explains why a ball bouncing into the stands from the top of the wall is a home run and why a ball bouncing into the stands after bouncing off the wall at a height below its top is considered a bounding ball and not a home run. Minute Maid Park agrees: "Batted ball strikes higher wall or railing at a point above the lower wall and rebounds over lower wall: Home Run." There is no ground rule for a point lower than the top of the lower wall. Without a Ground Rule to address it, as in KC, a less-than-top-of-wall-to-stands hit is two-bases. Miller grabs the headsets in Houston. Conclusion: The ball did not strike the top of the wall in Houston; it bounced off the middle of the fence below the height of the top of the wall it bounced over. For that reason, this bounding ball was subject to Rule 5.05(a)(7), making it eligible for a two-base award upon subsequently clearing the adjacent outfield wall at a point higher than at which it initially struck the padded fence (making it ineligible for the aforementioned Houston ground rule). Score it a double for Altuve. As far as Replay Review is concerned, this is a rare instance in which the Replay Official overturned a matter of rule interpretation, as opposed to a simple judgment call...unless, somehow, the umpires did not see the ball striking anything below the height of the lower fence-adjacent wall in right field.